Jesus preaches the Kingdom of God…Who is the Kingdom of God? Saints are those people whose love for God is stronger than their love for anyone or anything else. The Church is the Communion of Saints. 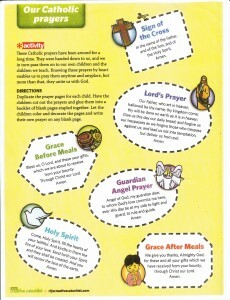 We cut out the prayers on the handouts “Our Prayers”(below) and pasted them to the inside covers of our books and folders. We will refer to them often. On the third day he rose again. and rose again on the third day in accordance with the Scriptures. who has spoken through the prophets.I believe in one, holy, catholic and apostolic Church.